This year, DineLA Restaurant Week moved up from fall to the very first summer DineLA, weekends inclusive! While I’m a little bummed that there won’t be a DineLA during my birthday in October anymore, I still love checking out new restaurants at discounted rates any time of the year. Cassandra and I took this opportunity to try Wilshire Restaurant, not one mile away from the office. The food was fantastic, the price (rated $$$ – $25/person) was great, the service was friendly, and the ambiance was relaxing (albeit a little too leisurely for weekday lunch break). 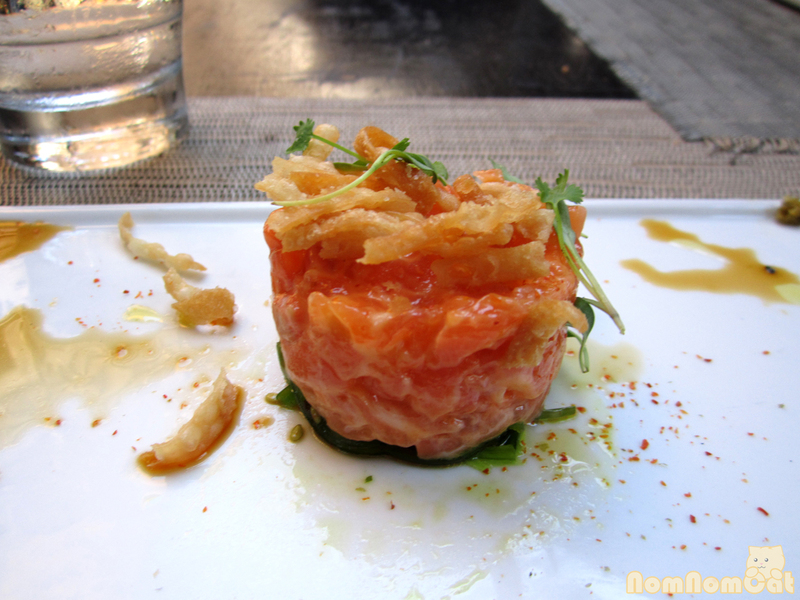 The starter that stood out to both of us was the salmon tartare with yuzu, and it certainly did not disappoint. The yuzu sauce was refreshing with its bright citrusy notes which contrasted well with the slightly creamy tartare. The bed of wakame (sesame marinated seaweed) was a pleasant surprise underneath the beautifully orange salmon and the crunchy fried wonton strips added an interesting texture. It brought to mind one of my favorite guilty pleasures — (diced, not mushy) spicy tuna on crispy rice. 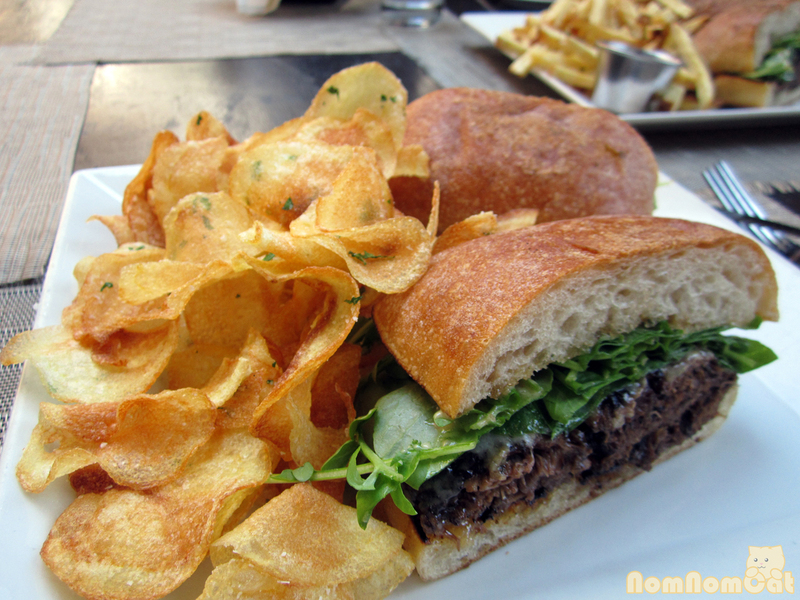 We also selected the same entree – the braised short rib sandwich with harissa aioli, hers with the Kennebec fries and mine with truffled chips. The chips! Oh the chips! They were clearly made in-house, crispy and fresh out of the fryer, and gently tossed in a light drizzle of truffle oil, a dash of salt, and a sprinkling of parsley. So delicious! The sandwich was absolutely delectable. The braised short rib was lovingly slow-cooked ’till it was nice and tender and it was bursting with flavor with each bite. The sandwich was held together perfectly by a fresh square of ciabatta and the watercress complemented the sandwich and cut some of the richness from the fatty meat and aioli. I could only finish one of my sandwich halves and took the other one home. We were most looking forward to the dessert; to be honest, it was one of the main reasons why we chose to dine here rather than the other places we had bookmarked. We ordered one of each to try – the strawberry shortcake and the sticky toffee pudding. First, the good news. 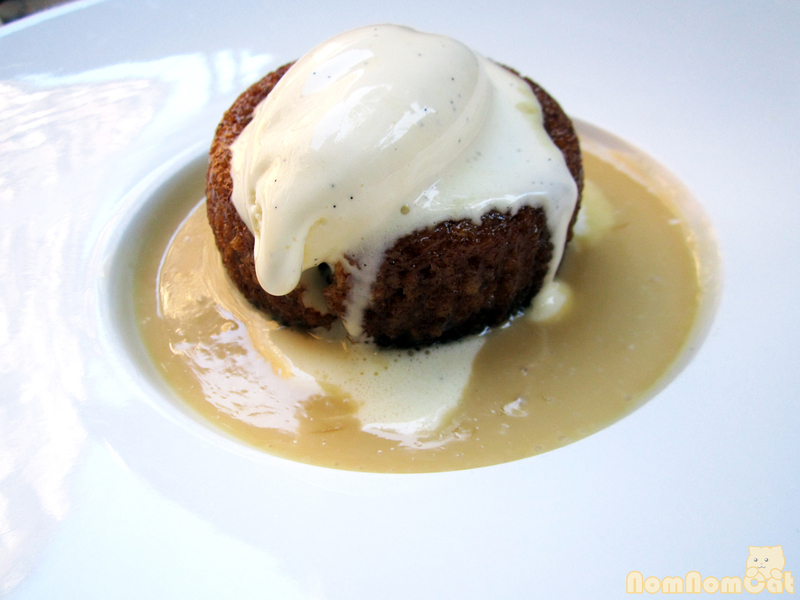 The sticky toffee pudding arrived warm and soft, topped with a dollop of vanilla ice cream that had already begun to melt over the cake. It was, in a word, heavenly. The pudding itself was not too sweet (perfect for me) unless you lucked into a bit of toffee, at which point it got a bit cavity-inducing. As if the braised short ribs didn’t impress me enough, I would come back here just for the sticky toffee pudding. The strawberry shortcake, however, looked stunning but was a bit disappointing. The biscuit was too dry and crumbly, and the whipped cream was a bit dense. 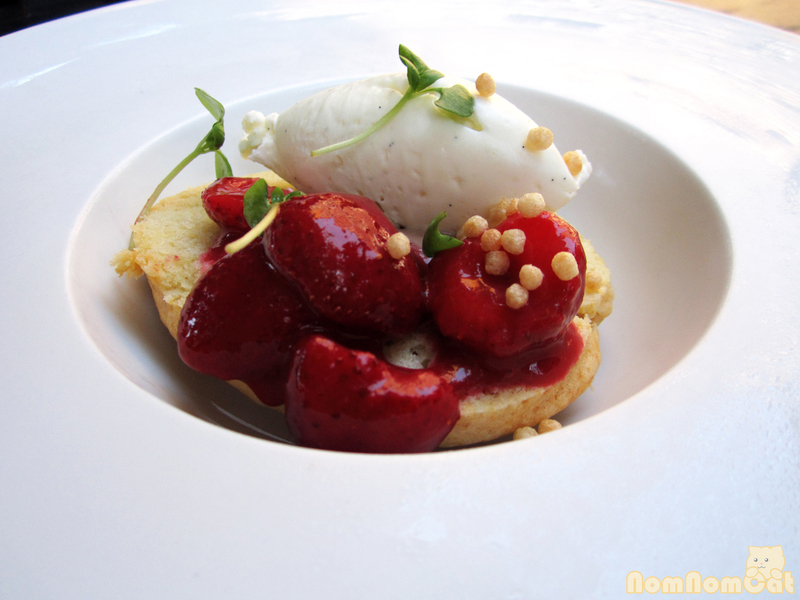 The plump macerated strawberries were fresh and sweet, so that wasn’t a total loss. Still, it paled in comparison to the other dessert option. The outdoor patio was beautiful even during the day. We noticed lights strung across the patio and heat lamps set up for cooler nights, and I think it would be wonderful to dine here for a romantic al fresco dinner! 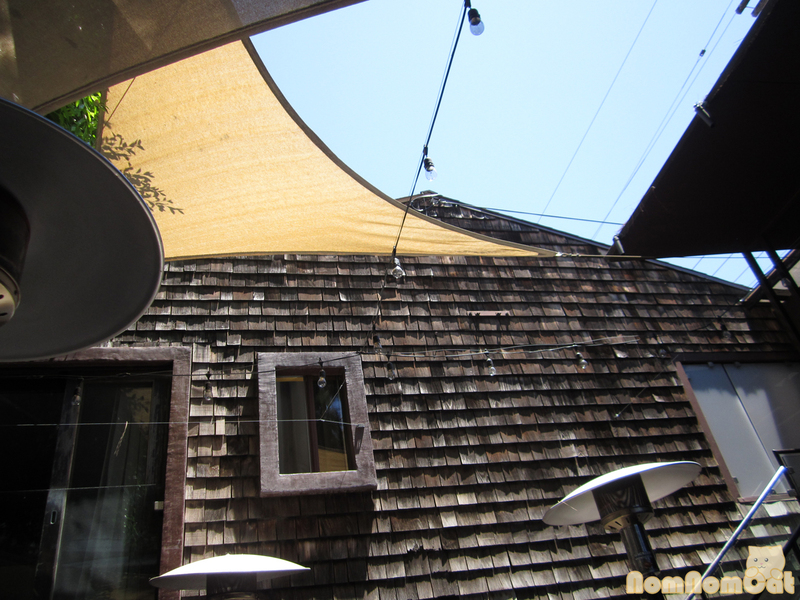 The service was friendly but with the patio being so large and dineLA bringing over twice as many patrons as usual during lunch hour, the experience as a whole did last longer than we had expected. No problem if you’re here for a casual meal but potential issue for those on break from work. If you have the time though, I recommend trying their lunch lineup. DineLA Summer 2012 runs from now through the 27th, so go check it out if you’re in the area! After DineLA, you can still get a similar selection of courses during lunch on their summer menu.